CW Shows were being done by DC Collectibles, as well as Mattel's Multiverse line. From what I've read, it is only the Multiverse line now. Gotham is being done by Diamond Select. Comics are being done by a variety of different sets, including Mafex and Figuarts. High end is Hot Toys and the like, obviously. Have there been any announcements on the new shows for Titans, Swamp Thing, or Doom Patrol? And have there been any announcements about Young Justice toys? Also, if a character is introduced, I'm seeing it normally takes toy lines two years or so to catch up and make the toy (like the new Wally West Flash suit). Is that normal? I'm curious because I want to finish up my current Justice League collection (what is this current era even called? It's definitely not Rebirth anymore...). Also, I have a much harder time keeping up with DC toys than Marvel, for some reason. 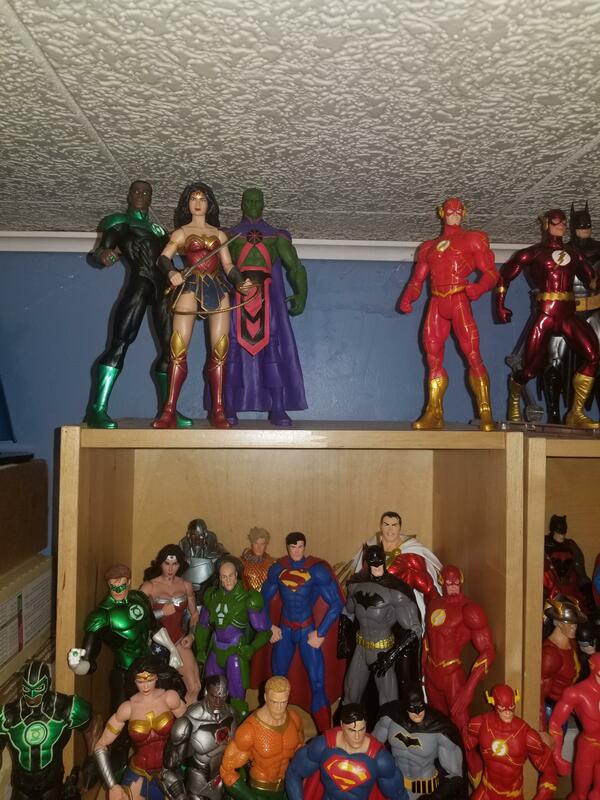 How do you collectors keep up with what DC releases? My own collection is skewed heavily in favor of DC over Marvel. Last edited by bearytrek; April 6th, 2019 at 07:19 PM. You are a scholar and a saint! Wow, that is everything I was wondering! Sounds like the same thing Bandai did with the PR line is what Mattel is doing to DC. Such a shame, because (like I mentioned), I greatly prefer DC figures. Hmm... I don't know how I feel about DC focusing on statues. :/ I hope McFarlane toys does something different, too. Hopefully the success of movies like Shazam can help boost DC popularity again. Shame about Young Justice... really wanted a 6" Miss Martian. Yes, I found it so odd that Collectibles and Mattel were doing the same figures at the same time! It made no sense to me! Yeah, so many characters from CW that could have been made. It's such a shame! XS, Iris, Spartan, the last 2x Flash suits, the new Legends, Elongated Man, Letscher Reverse Flash, etc. Yes, I was so surprised at how good the Multiverse Aquaman figures turned out! i will point out that mcfarlane himself he doesnt see the point of articulation. he prefers looks. however mcfarlane is making the fortnite figures and people are raving about those so again, who knows? itll be the middle of next year so we probably wont see much till toyfair 2020. Ah, well I'm excited to see how things end up! I hope they can revitalize the brand! Now for the current Justice League line up... which existing Superman, Batman, and Mera toys does anyone recommend to fill the holes here? I'm thinking any 2000s Superman, right? And I was wanting to do Hush Batman, but it seems like he had a blue tint during that run that doesn't match his current suit... thoughts? And I guess I'm gonna have to just wait on a good Hawkgirl. Oh, yes, that Mera is fantastic ^_^ Thanks a ton! Yeah, I believe I have all of the 6" that was released for YJ. I think the only Superboy they made was his intro in the white suit, and I think the only main member who didn't get a 6" from season 1 was Miss Martian. The Blackest Night/Brightest Day figures are so great. So inspired! I have to figure out a way to better track the upcoming DC figures. I looked at ToyArk but they don't have release dates. It seems like Marvel toys are much more organized for some reason. And another question - some knock off company made a "hot toy" Jerome called The Laughter and by the time I found out about it, they stopped making them. Is there any word if Gotham is done with their toys since it will be the last season? I hope not because I want both versions of Gotham's Joker.